I have a Seaco Via Venezia that is around 10years old. It still works fine except for the pressurised portafilter springs and plastic bits have failed. So I guess I now have 3 options and i'm not sure what to do. Any advised would be very much appreciated. 1. Replace the portafilter with a new one. 2. Convert to un-pressurised and buy a Brevile smart grinder pro. 3. Buy a new machine and grinder , but I don't have a huge budget so would probably only be able to get a similar class machine. New ones currently seen on the web for $279 +S10 delivery from a well known sales outlet, Cheers, Ron. 10 years shouldn't be a problem for the machine. Cheapest option by far is to buy a new pressurised portafilter. They sell them at the Saeco supplier. If you want to take it to the next level you could get a naked, bottomless, portafilter from seattle coffee gear but then you will also need a half decent grinder. So 10 years is not too old for a coffee machine! Perhaps I'll look at either fixing or going unpressurised. Is the Breville BCG820 OK? Seems to get good reviews. Been looking around a bit. 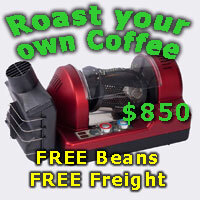 Perhaps it may be better to spend a bit more and get something like the BES870 or EM6910 plus grinder. Thoughts? Last edited by nac; 12th August 2014 at 06:21 PM.